How can Professional Learning Teams, busy with the day-to-day schedule of planning, teaching, grading, and team meetings, effectively merge the Common Core’s emphasis on text complexity with skill instruction that equips students to comprehend and analyze these complex texts? One of the key requirements of the Common Core State Standards for Reading is that all students must be able to comprehend texts of steadily increasing complexity as they progress through school. By the time they complete the core, students must be able to read and comprehend independently and proficiently the kinds of complex texts commonly found in college and careers. Anchor Standard 10 Grades 6-12: Range of Reading and Level of Text Complexity. Read and comprehend complex literary and informational texts independently and proficiently. In Grades 6 – 12, this Anchor Standard for Reading is tailored for each content area of English Language Arts, History/Social Studies, Science and Technical Subjects. My initial question then divided into three prongs as I contemplated how Professional Learning Teams can determine text complexity while planning curriculum. What exactly is text complexity? How can my PLT accurately measure text complexity for our content area? How will my PLT select materials that enable students to climb the staircase of text complexity? 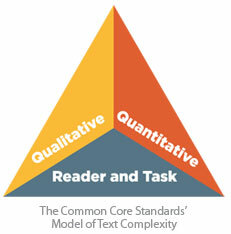 The Standards Model of Text Complexity consists of an equilateral triangle divided into three obtuse triangles comprised of Qualitative, Quantitative, and Reader and Task. Following is a summary of each obtuse triangle. Level of Meaning for literary text or Purpose for informational text: The text with a single level of meaning and straightforward purpose would be easier to comprehend than a text with multiple levels and a purpose that must be inferred. Is the structure simple and chronological? Or is the structure more complex? Do graphics clearly contribute to the meaning of the text? Or, do graphics demand the reader’s interpretation? Is the language literal or figurative? Is the language contemporary or archaic? Does the text rely on everyday life experiences or content specific knowledge? Qualitative characteristics refer to the quality of the text and are the most challenging to ascertain. The PLT must combine qualitative components with professional judgment when assessing the qualitative measure of a text. For many years, my staff development partner and I introduced teachers to readability formulae such as Frye and Raygor, based on word length, syllable count, and sentence length. After completing a series of steps counting both the words and the sentences, the results were plotted on a graph that purported the “readability” (grade level range) of a text. There are clearly limitations to the readability formulae, for text complexity cannot be simply ascertained by numerical operation. Rather, the PLT should utilize the lexile analyzer to compute the complexity of a text. Common Core refers to text complexity grade bands and corresponding lexile ranges for each grade band. 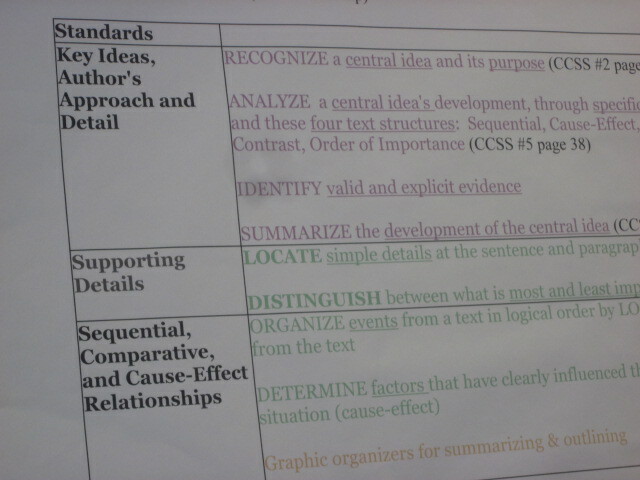 Refer to CCSS Appendix B for text exemplars. Theses exemplars are by no means a national reading list, but rather suggested texts that satisfy the components of the triangle of Text Complexity. Compare and contrast texts selected by your PLT to text exemplars to determine similarities and differences. Systematically analyze text by measuring qualitative and quantitative characteristics as well as ascertaining the reading skills of your students. As you can see, text complexity is truly a muti-faceted issue as educators work to prepare students for college and career readiness. By understanding the components of text complexity and working with your PLT to select appropriate texts, your team will be on its way to helping students comprehend and analyze complex texts. Stand by for a future blog: Strategies to enable students to skillfully read and comprehend increasingly complex texts. What does College and Career Ready Really Mean? While reading “The Early College Challenge” in the American Educator (Fall 2011) I was struck by the “what if” questions proposed by authors Rosenbaum and Becker. They suggest placing college course learning opportunities on the high school campus to ensure high school students are better prepared for college learning. However, these recommendations strike me as an avoidance of the many complex issues of public high school responsibilities. high schools use a “package-deal curriculum”. high schools keep students on track by closely monitoring student progress and giving them guidance. high schools explicitly teach study skills. high school teachers plan backwards from college so students become college ready. The conundrum lies in the question: Aren’t high schools doing all this? And if not, is it funding issues that limit the public schools capabilities? Or is it influences entirely outside of school which limit student success? As a parent of two college freshmen, one female and one male, (as well as being a high school English teacher/Reading specialist) I may have a unique voice on the issue. Were my children adequately prepared in high school for the college classroom? Will they be career ready? I say yes, though in ways that fit their unique capabilities. So what does it mean to be college ready? Passing scores on all assessments or just some? What assessments should be mandatory for college course enrollment? Who designs these assessments? Are they standard across universities? What skills do these assessments measure? How will K-12 know what universities know about the Common Core? 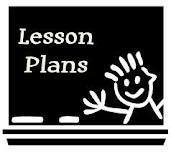 here is a Common Core standard you will master by doing these lessons. here are the Common Core standards you must master in order to approach college coursework. Did my son and daughter master each of the Common Core State Standards? I do not know as implementation is fledgling at best. And therein lies the dilemma. How will a high school diploma signify mastery of the standards? As K-12 educators across the nation read, learn and write about addressing 21st century skills, we must determine how to join together with university professionals to share expectations and understandings of academic readiness and ensure that students receive assessments at standard exit and entrance points that are valid, reliable, and built on similar expectations linked to the CCSS. Let’s leave college courses to the university and focus on high school student’s mastery of high school skills and standards. Finland, Rosenbaum and Becker write, with a population of 5.4 million living within 130 thousand square miles, prepares their homogeneous population well. Yes, we know. Our task as educators in this country is daunting; how can the heterogeneous United States, population 312 million living within 4 million square miles, do the same? What exactly are data-driven decisions? I am a little worried that the word “data” might be getting a bad and undeserved rap. Let me state up front that I am an advocate of data-driven decisions and no, I am not a left-brained mathematical mind. In fact, I am quite the opposite and once upon a time never imagined that the word “data” would EVER enter my vocabulary as a teacher. So why am I a convert? Because I know how powerful teaching and learning becomes when teachers use student data to make immediate plans and changes to their instruction. I will define data-driven decisions as simply using assessment information/student work to respond to student needs. Yes, there are numbers involved and sometimes even large tables in green, yellow and red that at first seem intimidating. Especially if we aren’t used to looking at students in this way! In addition, doing this collaboratively is a mindset shift. Go ahead and test my hypothesis the next time you have student data to analyze in your professional learning communities. If teacher-teams analyze common formative assessment results in a collaborative frame of mind with the intent to reflect and plan instruction, then the overall individual teacher workload will decrease and teacher creativity and student learning will increase. 1. What can we infer in general from your data? 2. How will each class approach the topic during the following week? 3. Which students need enrichment within the classroom? 4. Which students need intervention supports within the classroom? 5. Which students need solidifying in the concepts? 6. How will we group students in order to meet their needs? 7. What resources do we need for enrichment, interventions and solidification? Which team members will collect the various resources? 8. What will my lesson plans for the next week look like based on this data? 9. How will we formatively assess during the week to make sure we are on the right track? 10. How will we keep all students engaged? 11. Do we have any questions for a particular teacher? Click here to view graphic organizer to help analyze and plan. What will instruction look like in the different classrooms? What will be the similarities between the classes? What will be the differences? Did teachers have autonomy in answering these questions? Do teachers need to be creative and innovative in solving this instructional puzzle? How will teachers sharing the load of educating ALL students lessen the individual load? The answers to these questions will provide the team with information they need to plan effective and timely differentiated instruction until the next assessment. Please let us know what you gathered during this process. Who’s for the Giants? Who’s for the Patriots? During a break, he even played the Chicago Bear’s 1985 SB Shuffle. That brought back some fond memories. I shake my head in wonderment, asking myself why so much energy is focused around not only this sporting event, but the other sports from basketball, baseball to hockey. Imagine if this much energy was focused on teaching our students and teacher preparation. Just imagine. I was interviewing potential teaching candidates recently, hoping to get a pulse on undergraduate teacher preparation curriculum. One thing that struck me was the inability for these future teachers to articulate the current discussions in education. I expected these students to talk about the newly adopted CCSS, professional learning communities, common formative assessments, and response to intervention. Or at a minimum have a theoretical foundation in differentiated instruction and formative assessment. I wanted to hear them discuss effective, instructional strategies from Hattie and Marzano. The theme of these interviews was the candidates expressing how energetic and enthusiastic they are. These are great attributes, especially in a new teacher. However, what current skills are they bringing to the profession to help build a 21st century learner? I have worrisome impressions they are entering a profession without any idea of the true demands and initiatives of what effective teaching is today. If we are to improve student learning, it is not enough for our new teachers to be trained by their new employers. It is imperative that teacher training regarding current research begins in teacher preparation courses. I believe imbedding these five aspects in teacher training programs can make a positive impact on education. Learning how to use the Common Core as the vehicle to drive 21st century curriculum will provide students with the necessary skills to be ready for the next level in school. Today, building team autonomy is extremely important as we focus our efforts on collectively improving student learning through regularly scheduled meetings around student data. Common Formative Assessments give teams an opportunity to measure student data and monitor student progress. Discussions on instructional methodologies takes place in the PLCs when student data is analyzed. What happens when a student or a group of students does not develop proficiency in relation to a set-standard? What can the teacher do in the classroom to help the student attain proficiency? How do we, as teachers, vary our instruction and/or content to create the best learning environment possible? What happens if a student continues to struggle in the classroom, even after the teacher has differentiated instruction in the classroom? What systems are in place for students to get tutorial assistance to attain the skills in the curriculum? How are students monitored and assessed to ensure skill development? Focusing on these five aspects will make a difference in our students and help them become 21st century learners. I want to hire teachers that possess these fundamental skills in teaching our students to be successful life-long learners. How can we accurately measure what our students know and are able to do? How should we modify instruction to optimize student performance? Classroom Assessments, both formative and summative, consist of selected response, constructed response, and performance assessments. When your PLT delves into constructing classroom assessments, begin with selected response using multiple choice items. Although multiple choice items can be tricky to write, your PLT can quickly and effectively gather a great deal of data on student progress. Correctly constructed multiple choice test items reflect the skills and concepts of the Common Core State Standards. Refer to the analysis of your priority standard by utilizing your SACI template. Use the unwrapped standard to guide the creation of the assessment. Make sure that the skills and concepts are the focus of the assessment. Also keep in mind the level of Bloom’s Taxonomy inherent in the standard. Your assessment should reflect the same cognitive level that was utilized during instruction. Keep in mind: Tests, don’t trick! Topic: The reading passage should be a topic similar to textual readings the students have been doing in class insuring that students are equipped with necessary background knowledge. Remember, your assessment measures the skills and concepts of the standard. It should not be a test of reading comprehension. The main argument the author makes about _____ is . . . The passage primarily emphasizes . . . The passage clearly indicates . . . Details in the passage suggest . . . The passage (or author) implies . . . The reader can infer that . . . The tone of the passage is . . . The writer’s overall feeling toward is . . . This passage is probably taken from (source) . . .
As used in the passage, the word means which of the following? As used in this line or paragraph, the phrase or word most nearly means . . . Provide 4 answer options (1 right answer, 1 option that is close to correct and could reflect a misconception, and 2 options that are distracters). Answer choices should make sense and be plausible. Answer choices should be uniform in length and grammar. Avoid using confusing phrases such as “None of the above” and “All of the above”. The priority standard should be written at the top of the assessment. Students have a right to know what skills are being assessed. Font should be readable and uniform throughout the test. Any charts, graphs, or other visuals should be clearly labeled and easy to see. Passage lines should be accurately numbered if students must refer to a line of text. If a passage is on one page and the items on another, make sure these pages face each other rather than duplicated on the front and back of a single sheet. Once the PLT has created the assessment, it’s time for peer review. Ask each member of the team to carefully “take” the assessment. Look for features that might mislead your students such as: typos, confusing vocabulary, questions and stems that just don’t make sense, or misleading wording. Now it’s time to administer your assessment to your students. As you score the assessment, compile the data on a measurement system such as Mastery Manager. With your PLT, examine the data to analyze both student performance as well as the strengths and flaws of the assessment. The data will indicate the effectiveness of your instruction as well as the strengths and flaws of the test items. Use the data to revise the Selected Response Assessment. Congratulations! If your PLT follows these easy steps you will create a multiple choice assessment that accurately measures student performance and can guide the modification of future instruction! These three short sentences, read just a day ago, hit me like a thunderbolt. It doesn’t have to be epic. The intention to be epic gets in the way of doing work. I know this, because I’ve tried to be epic. Professional blogger Ev Bogue, startled me into rethinking the sweeping plans and goals I keep setting for myself as a teacher – yet never quite reach. Due to an increasing familiarity and understanding of the new Common Core State Standards, and due to participation on a professional learning team (PLT) I’ve acknowledged over the past year that I sorely need to renew the focus of my lesson planning in order to strengthen classroom instruction: particularly in my senior elective English class. This semester course attracts students with wildly varied reading and writing skills. Yet due to the nature of the course, it is possible that students who seem to get away with doing too little, yet pass, are those who are most in need of remediation. How do I strengthen the course requirements in order to do a better job of reaching these students? #1 Students self-select independent reading texts in this course. Use the CCSS Appendix A – sections entitled “Why Text Complexity Matters” and “College, Careers, and Citizenship: Steady or Increasing Complexity of Texts and Tasks” as an informational piece on the first days of the new semester. Let students read, analyze and discuss what researchers have found regarding levels of vocabulary difficulty and how college course reading expectations differ from those of our high schools. #2 Students generally choose contemporary young adult, high interest, best-selling novels. Use the CCSS Appendix B text exemplars to inform students of expectations for high school graduates reading capabilities. Require students to choose text in a more thoughtful and direct way, perhaps including analysis of reading level and engaging them in analysis of text complexity. #3 Students write short reader responses. Use the CCR Anchor Standards for Writing to tighten up response expectations, including making these timed argument, informative, or explanatory pieces with clear expectations as described in a thorough rubric. #4 Students share all book selections with the class. Use the CCR Anchor Standards for Speaking and Listening to tighten up classroom expectations regarding the information currently shared in a Socratic format, including research and presentation of authors as well as story line. Renewal of instruction does not have to be “epic”. I need to do two things: focus instruction on the standards, and share with students the established expectations of our state and district in order to strengthen and refocus their learning. We wish you continued success for the remainder of the 2011-2012 school year. Please share our content with your colleagues and follow us on Twitter @core4all. As an instructional coach, one of the most common concerns I hear from teachers is the lack of student motivation. Students are not interested in the material, are disengaged, disruptive, and lacking initiative. The Common Core State Standards are rigorous standards with higher levels of texts at each grade level than the present standards in most cases. If my students are not motivated now – what is going to happen when the curriculum becomes more challenging? Here are the daily strategies to keep learners focused and engaged in learning adapted from The Highly Engaged Classroom (Marzano, Pickering & Heflebower, 2011). Am I doing everything I can to get to know all of my students and let them know I care about them as individuals? How can I gather positive information about students? How can I show interest and concern today? Positive is best but any feedback that is specific gives students the information they need to improve and as a result encourages them. When a teacher takes the time to say, “That summary is excellent because you have really made tremendous improvement using your paraphrasing strategies!” shows students you really are paying attention to all of the details of their learning and they feel KNOWN as individuals. It also shows you are also working very hard to make sure they learn and students always respect that. I have found one of the most motivating strategies is to have students track their own progress. This is something often used at the elementary level but seems to dissipate as students age. Adolescents respond very well to tracking their own progress in a visual manner and many students are visual learners so this strategy really resonates with them. Most students respond very positively to monitoring their own growth on learning targets. It is a great tool for students used in tandem with providing specific feedback. In our data-driven culture, which I encourage, we must remember that teaching is a “feeling” profession. We already discussed the importance of building relationships but another key component of engaging students is showing our own enthusiasm for teaching and learning. Our feelings about what skills and concepts we are teaching play a very large role in how students will respond. Find areas in the curriculum that you can show extreme enthusiasm about. Share personal stories and make as many connections as you can to bring the material to life. We all share a common goal; student learning. We want our students to do well and succeed. A combination of a skills-based curriculum around the Common Core and a focused attention in providing an environment through positive relationships and motivation will help our students be more engaged learners. For those of you who attended the Rising Student Achievement Conference in St.Charles, IL in December, we have attached our PowerPoint presentation here. Core 4 All would like to thank all of you who have been reading our posts and have participated in our staff development training sessions and workshops. We have really enjoyed meeting and working with so many great educators. Your students are lucky to have such dedicated professionals as yourselves. If you haven’t done so yet, please get a copy of our eBook titled Implementing the Common Core. It will provide you with a framework to building curriculum around the Common Core. Finally, we want to wish everyone a very happy and healthy holiday season. 2011 showed us that collectively, we can make a difference in preparing our students to be the leaders of tomorrow. We are looking forward to an even better 2012. Have a Happy New Year.